It would be an understatement to say that it’s been a momentous few years for Rita Ora. Following the release of smash hit new single ‘Let You Love Me’and the announcement of her album ‘Phoenix’ due for release on the 23rd November via Atlantic Records, Rita Ora today announces details for her 2019 global tour. Rita recently entered the Official Chart history books, breaking a record held for 30 years. The singer’s latest release,’ Let You Love Me’, became her 13thTop 10 on the Official Singles Chart. It means Rita set a new UK chart record for the most Top 10 singles by a British female artist. The star overtook music icons Shirley Bassey and Petula Clark, who each lay claim to 12 Top 10 hits. Rita has sold a staggering seven million singles, had 13 top ten singles (five of which received platinum status and five of which are gold certified) and a number 1 platinum-selling debut album all under her belt. After appearances on Hollywood’s silver screen, she returned to music last year with a sold out, thirty-three date European tour. Her latest five hit singles have amassed over a billion Spotify streams worldwide, with global hit Your Songreaching more than 352M streams alone. It’s also her biggest hit in Europe. Another global top ten hit arrived in August withLonely Together, collaboration with the late musician, DJ and producer, Avicii. Singles Anywhere, For Youand Girls followed, with each earning domestic and international success. Her latest hits will all be featured on her upcoming November album,Phoenix. Amazingly, it’s only her second studio album, but she’s proud, thankful and excited for its imminent release. 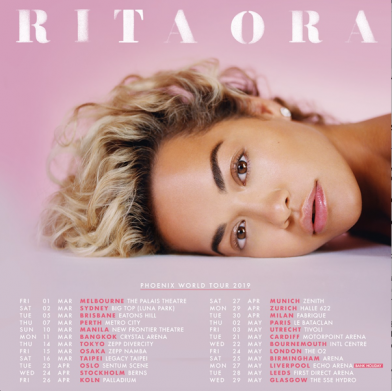 Rita has already cemented herself as one of the UK’s most successful pop acts of the decade and performed around the world to critical acclaim – don’t miss your chance to see her live.